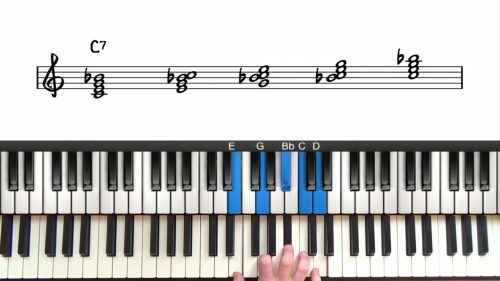 Welcome to this tutorial on Body and Soul for the accompanying pianist. This ballad is an absolute staple of any jazz setting. It’s well known and one that both singers and instrumentalist seem to universally love. 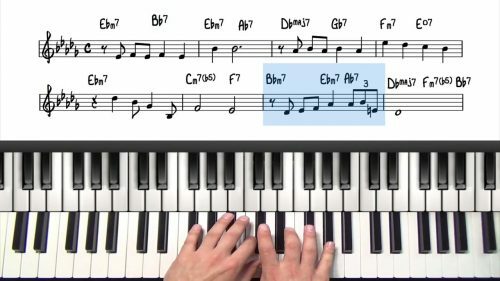 It’s got such a richness in harmony and 2 interesting key changes that it can be quite daunting to learn, let alone to memorize. And to further this challenge, our goal as the accompanying pianist is to know it so well that you can follow your singer in any interpretation, in any direction they lead on a moments notice. 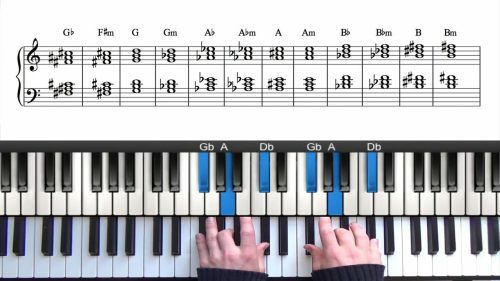 First, we’ll analyze the form, then play through the melody, and then start playing the harmony with simple right-hand chords and left-hand bass. That way we’ll get to know the tune from the ground up and lay the foundation to come up with our own arrangement. If you’ve seen the other Pianogroove tutorials on Body and Soul, you know this is an AABA form. And in this song, other than the turnarounds at the end of each 8, The A section doesn’t modify at all. So really we are only learning 2 differing sections. The A, then the B, or Bridge. Now that we are more familiar with the melody, let’s play through the harmony, using only the simplest chording. We’re going to pluck the triads in our right hand, then play the bass note with our left. We are going to keep it uber simple, only the root note in the left hand, with root position triads in our right hand. This is to get clear on the harmony cognitively as well as gaining muscle memory, and if it’s possible, to sing the melody as we play. When you feel comfortable with this first step, let’s get a bit more complicated, let’s do 1.5.1 bass notes in the left hand, and start mixing in some inversions in the right-hand triads, giving a thought to voice leading. Smooth transitions between chords can really add a soothing quality to this ballad about love and heartbreak. The idea is to try out different pathways and be somewhat spontaneous in your voicings, since it’s a ballad, even in tempo you’ll have time to think. Try starting out in a different inversion and see where you go from there… left always supporting the right hand, and the melody. When you are comfortable with that step, let’s get into our jazzier sounding 7th chords. I’m going to keep my left hand simple, and stay away from extensions. We’ll be adding those in the next video. But for now, we are just going to acquaint ourselves again with the rich sound of 7th chords, which is merely adding a 4th note to our triad, which is the 7th note in whatever scale we are deriving our chord from. When you feel comfortable with the basic structure of this tune, you can move on the more advanced accompaniment. It will show specific voicings which add in touches of color through extensions, as well as more complicated bass movement. But do keep in mind that simpler chording can work great for just starting to work with a singer, getting to know their version of the melody. It also works well for the singing pianist who needs to focus on their voice, and also for young and less experienced singers who might not know the tune very well. Especially with all the key changes on the bridge, making the tonality and harmony very apparent for your singer is super important. And this video has gotten you ready to do just that! So enjoy! The catchy melodic motives, complex chord progressions and unusual key changes make Body & Soul a favourite amongst most jazz musicians. A seventh chord is a triad which has been extended to include the 7th degree of the scale. This creates a fuller sound than simple 3-note triads. If you are a singer and would like to do more vocals exercises to ready you to sing this tune, you can check out the video on vocal exercises and advanced vocal exercises for Body and Soul. In those videos, we are using our voice merely to internatize and deepen our connection with the melody as the pianist, as well as quicken the memorization process.